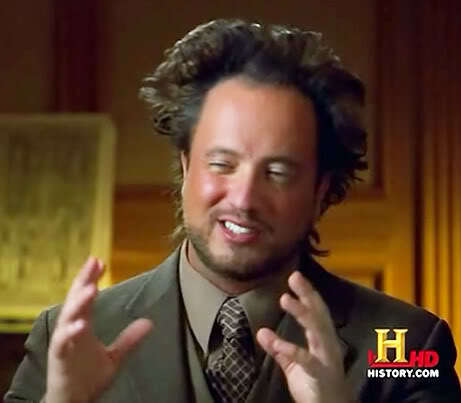 "I'm not saying that it's aliens... but IT'S ALIENS." But seeing as how FOUR e-mails have come in during the past 48 hours, asking for my take on this, it might as well get some blogspace. And this is the only time that I'm gonna touch upon this. The gist of the inquiries has been: "Hey Chris, what do you think about the next pope being Petrus Romanus from the Malachy prophecy?" It's one of the more prominent bits of odd lore accumulated over the centuries. That in 1139 an Irish archbishop named Malachy (later Saint Malachy) had a prophetic vision of all the popes that were to come until the end of time. Supposedly Malachy wrote down his vision as a series of Latin phrases for each respective future pope. And then - so the story goes - his recording of the vision was put onto the dusty shelves of the Vatican's archives and forgotten until 1590, when it was found anew. Anyhoo, after John Paul II's respective entry we get this: "Gloria olivæ", meaning "The glory of the Olives". That Benedict XVI chose his papal name in reference to the Benedictine Order, a symbol of which is an olive branch, has not gone unremarked by, ummmm... "certain folks". In persecutione extrema S.R.E. sedebit Petrus Romanus, qui pascet oves in multis tribulationibus: quibus transactis civitas septicollis diruetur, & Judex tremêdus judicabit populum suum. Finis. "In extreme persecution, the seat of the Holy Roman Church will be occupied by Peter the Roman, who will feed the sheep through many tribulations, at the term of which the city of seven hills will be destroyed, and the formidable Judge will judge his people. The End." So according to Malachy's vision, the next pope, "Peter the Roman", will be the occupant of the Vatican when the end of the world finally happens. Some have suggested that Peter the Roman will be the Antichrist, or at least the False Prophet described in the Book of Revelation. Awright, well... what do I think about this, Saint Malachy's "Prophecy of the Popes"? I think a lot of people are about to be disappointed. I do not believe that there is anything particularly mystical about Malachy's prophecies. For one thing, any one of the mottoes listed could be interpreted a dozen ways and more. The phrase corresponding to John Paul II has at least three that I'm aware of, including one that would mean "From the turmoil of the east", AKA from behind the Iron Curtain of eastern Europe (John Paul II coming from Poland in the days of Communist rule). For another thing, it remains quite possible that there exists, in the case of Saint Malachy's purported vision, a thing as "self-fulfilling prophecy". The "Prophecy of the Popes" certainly must be something that every Catholic clergyman is aware of. It's not hard to imagine that it would lurk on the subconscious edge of all who have ever been involved in the higher administrations of the Roman Catholic Church and thus, might play an unacknowledged part in the roll call of popes. So lemme be succinct: I believe that after Benedict XVI steps down as pope on February 28th, that there will be the prescribed Conclave of the College of Cardinals. A new pope will be elected. He will be according to our Catholic brethren the Bishop of Rome, the Vicar of Christ, the successor to Saint Peter. And then at the end of his term, whether by death or by resignation, he will be succeeded by another. And that pope will eventually be succeeded. And so on. In other words: Malachy's prophecy will probably be rendered thoroughly kaput during the next few years. If not months, or even weeks. Over four hundred years of worrying about the end of the world (at least on the papal forecast's watch) will cease. The "Prophecy of the Popes" will become considered an odd relic of Armageddon-ish hysteria. But I don't think for a moment that the Mother of All Silly Seasons isn't descending upon us fast and hard. If you thought that the "Mayan Apocalypse" stuff was crazy, y'all ain't seen nuthin' yet. 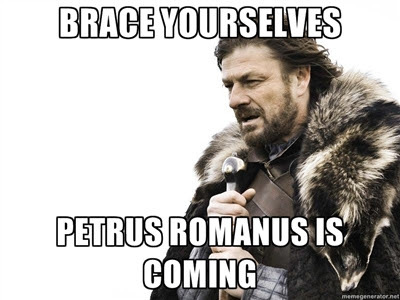 Heck, I've seen more essays and articles about "Petrus Romanus"/"Peter the Roman" - from both the mainstream press and "new media" such as established blogs - published in the past 48 hours than I've seen during the past fifteen years put together. Brace yourself, Dear Reader. The wackiness is already ramping up and it's about to go full-tilt balls-to-the-walls off-the-chain bonkers. Be of good cheer! Lord willing, I'm gonna be an old gray man taking my grandchildren to see Star Wars Episode XXVII someday. And long before that happens we will have all forgotten about the imminent hysterics. "I'm not saying it's the end of the world... but IT'S THE END OF THE WORLD." Interesting and funny article Chris! You neglected a detail that is worth mentioning. Malachy's list contains 112 mottos and they are sequentially numbered. Benedict XVI is 111. But there's no 112! After 111 it says only "In extreme persecution, the seat of the Holy Roman Church will be occupied by Peter the Roman, who will feed the sheep through many tribulations, at the term of which the city of seven hills will be destroyed, and the formidable Judge will judge his people. The End." It's also worth noting that the Catholic Church officially considers this (and many other such prophecies) forgeries and falsehoods. There are others, however, that the Church considers to be either correct or, at least, possibly correct. Check out the 'Three Secrets of Fatima,' which were revealed [by Marian apparition] to three cousins in 1917. There are a number of conspiracy theories around the third secret...since it was supposed to be released in 1960, but wasn't. At the time, a Vatican press release said that it was, "most probable the Secret would remain, forever, under absolute seal." Then it was released in the year 2000 by Pope John Paul II. Personally, I think the real one was released...but some still claim that the third secret has not yet truly been revealed, and the 2000 release was a deception. Considering that the third secret does sound very apocalyptic, and implies some great calamity for the Church, I'm not sure what bigger thing people were expecting. Interesting stuff, either way.